Another esoteric subject for Illustration Friday :). When I got this topic I immediately thought of my reflected zebras for "Black and White," much as I thought of my "Aging" illo for "Wisdom" (which I skipped). The topic of "Reflection" does bring up a lot of poignant ideas, but I decided to go for something real and tangible instead. 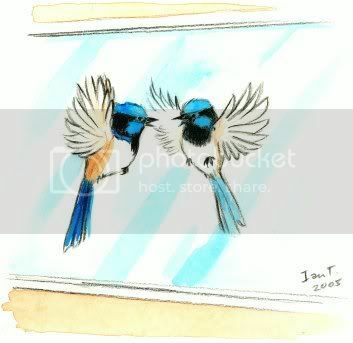 A lot of male birds seem to like fighting their reflections (which is poignant enough, when you think about it). Initially, I was going to draw a raven pecking its image reflected in a window. This happens a lot at one place I work: after screening was put on the windows to hold back the brightness the ravens spend whole days pecking at their reflections (even to pulling out the seals around the windows). The "solution" has been to install "bird spikes" - nasty, but non-lethal rows of prodding wires installed in front of the windows. Now the ravens peck a bit and get poked a lot, but it hasn't deterred them :(. I've seen a lot of other birds exhibit this behaviour as well - mudlarks (or peewees) at the railway station, and this persistent male superb blue wren, who used to wake us up every morning buzzing the glass, when we were housesitting in Warrandyte. We have blue wrens in our own garden as well, but the light on the windows must not work well enough to conjure an imaginary rival. This is a beautiful illustration Ian. I've seen birds do this sometimes too. I agree about its poignancy. I really like this piece, as well as the commentary that accompanies it. It's one of my faves thus far on this subject. I spent a good part of my day editing portraits of birds from my own garden :) We don't have blue wrens they must be a colourful addition South. The birds that knock three times a day on my window are asking for food! Punk Pigeon named Lady (native male) knocked himself out once. Apologies for the essay ... love your 'Reflection' entry! Lovely, Ian! You've captured that wing-flapping stance birds have in those situations. I love its face with the intent eyes and open beak! I'm so glad you did something for this week's topic...I enjoyed your explanation as well. I always learn something when I stop by! Just wonderful - it's a fine painting and a great commentary. I love how you approached the theme - it is indeed poingnant, and you've captured it beautifully! Nicely done! Some birds do that here, too. American robins, thrashers and especially mockingbirds will attack their own reflections in windows or even hubcaps. You just wanna knock some sense in their heads, but then realize they've been around long before windows ever have. 'Love the softness of this picture, and such a nice job of making the glass seem real. Your blue wren looks a lot like my state ( Missouri) bird, the bluebird, but I looked them up and then are in diferent families. It's a great picture! I love to watch birds and I hate it when they get hurt on a window. Great illo and interesting story. I didn't realize birds did much of that. Run into windows, certainly, but not fight with. So pretty! I love your birds! This is one of my favorites this week! Ah, I really like your take on this theme. definitely poignant and well executed. Anonymous, I look forward to seeing some of your bird pics! Jeope, thanks for your observations about window pecking birds in the U.S. - really interesting. I wonder if only certain families of birds are prone to this, but I guess not :). JacqueLynn, I know what you mean about the marking similarity to the bluebird, though they're quite different size and habit wise. The position this blue wren is in is atypical, with the tail down and wings out, and also the way I've drawn the window makes it look larger than they really are (they're tiny). Kerry, our "equivalents" of raccoons and skunks (niche-wise)would probably be brushtailed and ringtailed possums... or maybe the latter are more like opossums. Anyway, we have plenty of both around here! Vfm4, they do catch spiders under the eaves as well!